The Wiki Education Foundation organized its all-staff meeting in February. The meeting provides an opportunity for face-to-face meetings between local and remote staff, and encouraged an atmosphere of increased collaboration focused on skills development and the annual planning process. Between training sessions and discussion of annual plan priorities and goals, staff also engaged in team-building and social activities. Wiki Ed’s Classroom Program is on track, again, to break new records in student and classroom participation, with more than half of our students participating in Year of Science courses. 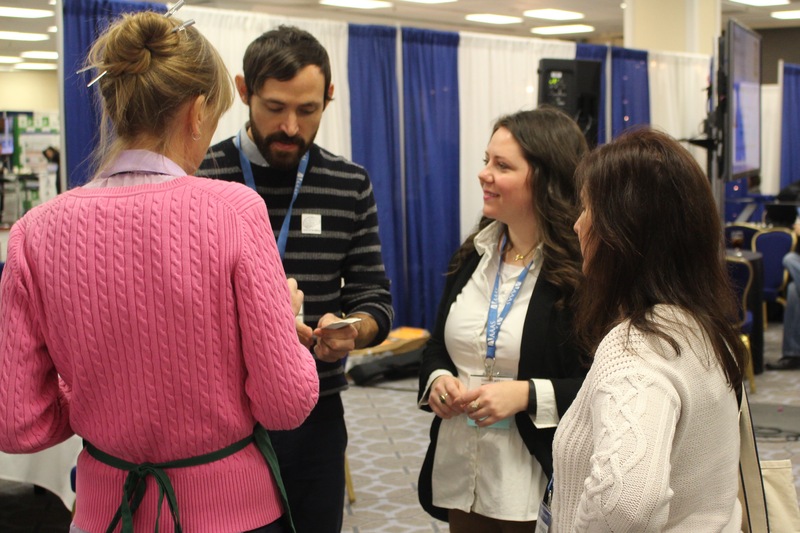 Education Partnerships Manager Jami Mathewson and Outreach Manager Samantha Erickson joined Simons Foundation staff at the American Association for the Advancement of Science (AAAS) conference in Washington, D.C. This was one of many staff visits to conferences and universities taking place in February. Wiki Ed launched the Wiki Playlist at playlist.wiki. The project, which went public on Valentine’s Day, is a means to share a love of Wikipedia’s content and increase Wikipedia’s profile among scientists in conjunction with the Year of Science. To this end, we encouraged high-profile scientists, academic associations, and others to share their favorite articles from Wikipedia, and show that Wikipedia is a resource embraced by academia and the scientific community. Also in communications news, the Year of Science campaign merited international press coverage in Vice magazines’ Motherboard blog, which is among the top 100 most-read websites in the United States, and coverage in the Christian Science Monitor. As part of our commitment to the Year of Science, Wiki Ed published a new subject-specific handbook for students working on topics related to genes and proteins. This is part of a suite of guides dedicated to improving science information on Wikipedia by provided focused guidance tied to specific scientific fields. Wiki Education Foundation’s Samantha Erickson and Jami Mathewson. This February, Jami and Samantha traveled to the American Association for the Advancement of Science (AAAS) conference with one of our Year of Science funders to officially launch our Year of Science. While in Washington, D.C., for this event, we also hosted a workshop with the Georgetown University Linguistics department and one with Wikimedia D.C.
Jami talks with AAAS members. We spoke with several interested instructors about the benefits of incorporating a Wikipedia assignment into their courses. Jami joined faculty at Temple University and Bryn Mawr College to promote the Year of Science, particularly focusing on writing more women in science into Wikipedia. Samantha and Director of Programs Tanya Garcia visited nearby California State University, East Bay, to host a workshop for librarians and instructors interested in hosting a course or a Visiting Scholar in Spring Quarter 2016 and beyond. Throughout the month, the Educational Partnerships team also worked to onboard new instructors for our Classroom Program while recruiting new sponsors for the Visiting Scholars program. To wrap up the month, Jami, Tanya, and Executive Director Frank Schulenburg hosted a group of Canadian higher education administrators to introduce them to our initiatives. We had an interesting discussion about expanding the Classroom Program at Canadian universities, and we look forward to developing these new relationships. Students edited 1,330 articles and created 65 new entries. Not to sound like a broken record, but the growth of the Classroom Program continues to be record breaking! We’ve exceeded our Fall 2015 number of participating classes (F2015=162 courses). That’s more than doubled from the same time last year (S2015=84 courses). 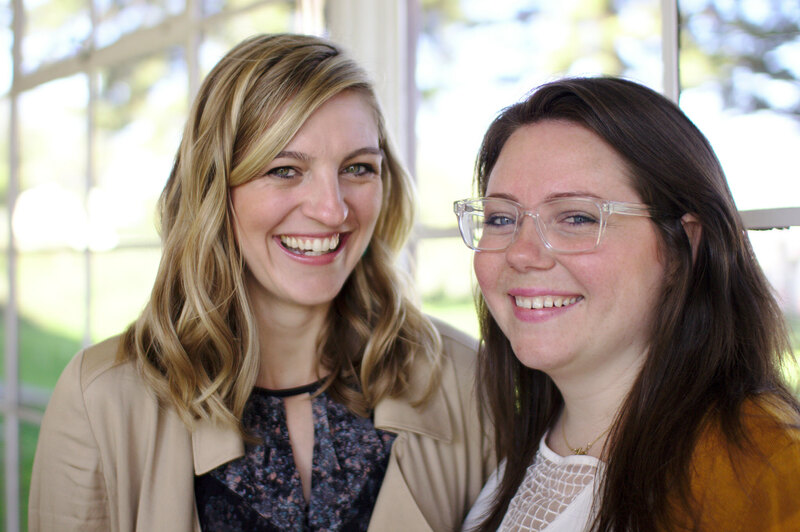 This rapid growth is the result of the hard work and careful planning of Jami and Samantha, who cultivate relationships with new instructors. 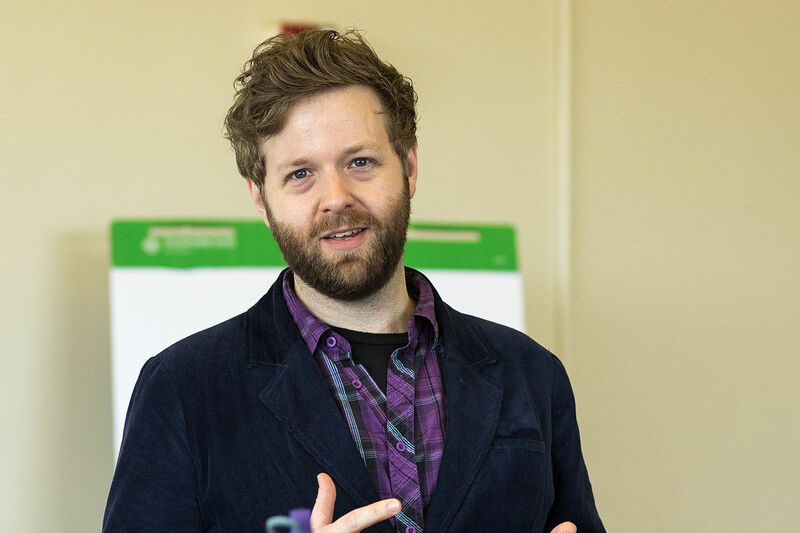 Classroom Program Manager Helaine Blumenthal, and Wikipedia Content Experts Adam Hyland and Ian Ramjohn, ensure classes in our program have a positive and meaningful Wikipedia experience. A significant chapter in this narrative of growth is the Wikipedia Year of Science. More than half of our students (1,517) are working on improving Wikipedia’s science content. They’re engaging on STEM fields and social sciences, with course topics such as Immunology,Exploring Heritage Languages, Biodiversity Conservation, and Media and Public Health. These numbers will continue to grow as more institutions finish winter quarters and prepare for spring quarter 2016. MHC restriction is a way for the immune system to distinguish between “self” and foreign proteins, and defend the body from invasion. A student in Immunology class expanded the article almost four-fold. It moved from a short, unreferenced article into something informative. The student added illustrations, extensive referencing, and sections explaining hypothesis of how the immune system learns to distinguish self from non-self. Another student in the class more than doubled the length of the TLR5 article, a protein involved in recognizing a certain bacterial protein. The student added information about how the cell goes from recognizing that protein to responding to it. There is a section detailing a possible role for this protein in disease. Other major expansions by students in the class included the Antigen-presenting cell and C3a (complement) articles. RHEB is a protein involved in regulating the cycle of growth and division in cells. People studying ways to control tumor growth find it interesting. A student in Chem 153A Honors class expanded the article. They greatly expanded the section about its function, adding sections about the structure of the protein and how it is regulated. Dehydrogenases are a class of enzymes involved in a range of important metabolic processes. A student in expanded that article from 100 words to a 2,648-word article. They added extensive information on the types of reactions catalyzed, and details of one important metabolic pathway that involves a dehydrogenase. Another student in the class more than doubled the length of the calmodulin article, adding information on its general function in the body and offering specific examples. A fourth student expanded the article on the brain protein eomesodermin from a short paragraph; they added information about the role of the protein in neuron development and in certain immune responses. Catherine Turney had been written out of Hollywood when User:Typeandrun, a student in Elizabeth Clarke’s Women in Film class, created her article on Wikipedia. Turney had been one of the first women contracted to work at Warner Brothers. She was successful at writing women characters, but never credited for her contributions to Mildred Pierce, which was nominated for an Oscar in 1948, or other films. Turney was quite successful as a screenwriter and playwright. User:Typeandrun has done a great job adding information about her life to Wikipedia. Clarke’s class has improved or created other articles on women in art. User:AmeliaDM created an article forJennifer Konner, who has won several awards for her television work, notably as a producer on Girls. Matilde Landeta, a Mexican filmmaker working during Mexico’s golden age of cinema, would not exist on Wikipedia, nor would Millefiore Clarkes or the other articles Clarke’s students have created. Beyond creating new articles on women in the arts, they’ve expanded and referenced dozens of others. Courses working on local history are especially exciting to support, because students can take advantage of archives of documents and local publications. That often isn’t feasible for the average volunteer. Kristin Dutcher’s Community History course at the University of Arkansas-Little Rock created two articles and expanded several more, citing local historical works and trade journals. The students created an article on Verna Cook Garvan, one of the first women CEOs in the United States, and expanded Adolphine Fletcher Terry, an anti-lynching advocate. They’ve also added to very local history, improving the article on a man who was briefly mayor to a town whose existence was only slightly less brief. Don’t worry, Baring Cross, Arkansas, wasn’t swallowed by the earth. It was absorbed into Little Rock after about a decade. Russian literature received a boost from Victoria Somoff’s Masterpieces of Russian Fiction course. Students added to articles on works by Tolstoy, Gogol (more than one), and Pushkin. Somoff’s students work is first-rate, and shows that even in a relatively well-covered area on Wikipedia there is room for improvement. Ryan McGrady presents on learnings from the Visiting Scholars program at Wiki Ed’s all-staff meeting. This month, Community Engagement Manager Ryan McGrady began working with Tanya on a thorough review of the Visiting Scholars program’s first six months. Ryan presented preliminary findings at the Wiki Ed all-staff meeting. The three Visiting Scholars positions from January are moving through various stages of the application process. We announced another opportunity: Hunter College is looking to work with a Visiting Scholar to improve articles on history and gender studies, with a possible emphasis on women’s education and historical women’s colleges. Ryan and Samantha are in conversation with another 28 prospective institutional sponsors of Visiting Scholars. Current Visiting Scholars improved 54 articles in February. George Mason University Visiting Scholar Gary Greenbaum’s article about the 1896 McKinley presidential campaign was promoted to Featured Article this month, after being the subject of a Did You Know on Wikipedia’s Main Page at the end of January. Around the same time, another of Gary’s articles, Lexington-Concord Sesquicentennial half dollar, was also promoted to Featured Article, just a few months after being named a Good Article. In total, the current Scholars have added 35,000 words to 265 articles (including 69 science-related articles during the Year of Science), which have been viewed 15.8 million times. They have also produced 11 Good Articles or Featured Articles, seven articles which appeared in the Main Page’s Did You Know section, and nine of the most-accessed but lowest-quality articles on Wikipedia. 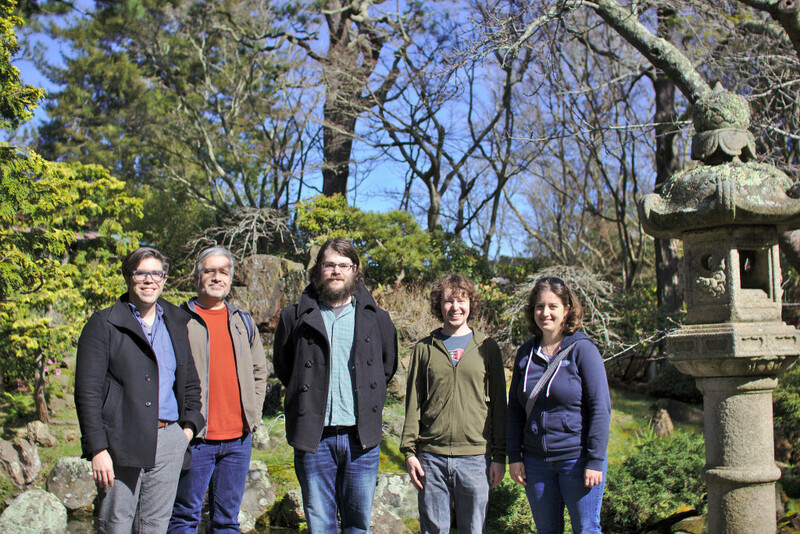 Wiki Education Foundation Program Support staff at the Japanese Tea Garden in San Francisco’s Golden Gate park. Communications Manager Eryk Salvaggio spent much of this month working on media outreach for the Year of Science. One of the first successes in this area was an article on Vice Magazine’s Motherboard blog, a widely-read primer on science and technology news. The article was widely shared onTwitter and Facebook, and sparked additional interest from the Christian Science Monitor. Director of Program Support LiAnna Davis was responsible for the launch of playlist.wiki, a website intended to raise awareness of the value of Wikipedia’s content, especially among scientists for the Year of Science initiative. Working with staff, notable scientists such as Lawrence Krauss and Janna Levin were reached and created playlists. The tool has been received with enthusiasm from the Wikipedia community. In keeping with our Year of Science goals, Wiki Ed released the final version of the Editing Wikipedia articles on Genes and Proteinsbrochure online. This brochure, written with input from Ian and WikiProject Genes and Proteins, offers advice on editing on one of the deepest levels of biological sciences. Sage Ross and Frank Schulenburg discuss future tech projects at a planning sprint at WINTR offices in Seattle. In February, we rolled out Wiki Playlists (playlist.wiki), continued improving the core features of the Dashboard, and began work integrating survey functionality into dashboard.wikiedu.org. 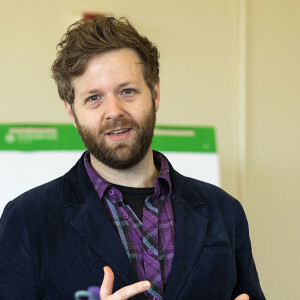 Product Manager for Digital Services Sage Ross worked with several Wikimedia Foundation engineers throughout February to make the Dashboard more flexible and useful beyond English Wikipedia. The Wiki Playlist project launched in early February, and we wrapped up work by mid-February. It was an experiment in several ways: it was our first social media-oriented project, and our first small-scale development effort that is independent of our main technical projects. It hasn’t been quite the viral hit we were hoping for — at least, not yet — but we’re proud of how it turned out, and pleased that we were able to complete it on time in a polished form. Sage made a bevy of bug fixes, reliability enhancements, and small improvements to the Dashboard. Sage and Eryk conducted user testing on the student training modules, followed by a round of small revisions and tweaks to the content. Feedback from students so far has been very positive, with many students pointing to the new interactive editing tutorials as particularly useful. We also switched to a more reliable web host this month, which should make unplanned downtime for dashboard.wikiedu.org much more rare. Wikimedia Foundation engineers Adam Wight, Andrew Russell Green, and Dan Duvall worked with Sage to begin adapting the dashboard for use as a multilingual “Programs and Events Dashboard” for the global Wikimedia community. Eventually, this work will allow education programs outside of the US and Canada, and all sorts of other community-driven editing projects, to benefit from the technology Wiki Ed has been developing. This pro bono collaboration will provide some enhancements to Wiki Ed’s Dashboard, allowing us to track of translation classes that edit across languages and — potentially — support classes that work on other wikis besides Wikipedia. Wiki Ed held an all-staff meeting tied to our annual planning process. Remote staff and San Francisco based staff were able to collaborate in person to discuss projects and goals for fiscal year 2016–17. The week consisted of several workshops analyzing challenges and accomplishments of staff members. The discussions from the session feed directly into the pipeline of annual planning. It also provides staff the opportunity to meet in person, and some staff members met each other face to face for the first time, and the week included team-building and after-hours social activities. 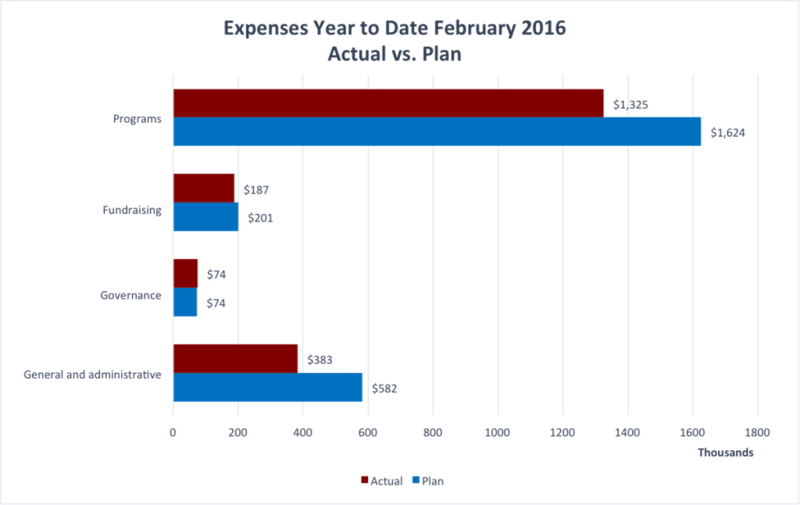 For February, expenses were $242,850 versus the plan of $277,056. The $34k variance can be attributed to our earlier decision to hold off on expansion of office space and staffing ($42k), as well as slight overages due to the timing of expenditures ($10k). 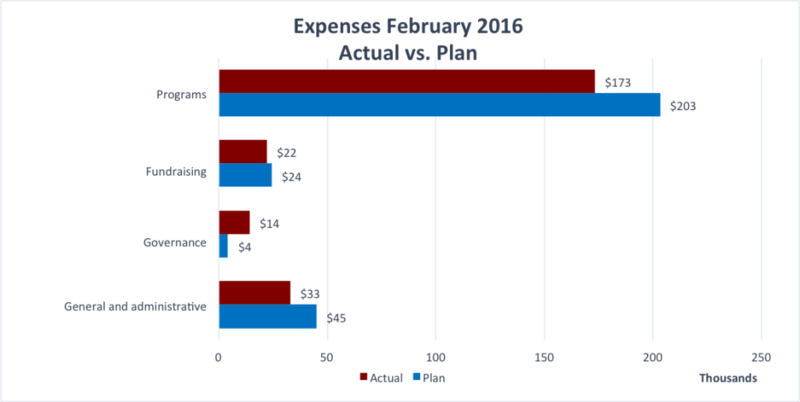 Year to Date expenses for February 2016. Our Year-To-Date expenses are $1,969,239, versus the plan of $2,480,324, a variance of $511k. The variance continues to grow, as planned expenditures have been held back until long-term funding is secured, and will likely not happen until at least next fiscal year. These held-back expenditures account for $440k of the variance, while the remaining variance is a result of the timing of expenses. Over the last 3 months, our spending level has averaged 79% of our planned budget. Tom Porter shares the Wiki Ed story to attendees at the Hewlett Foundation’s annual OER meeting. During the month of February, Senior Manager of Development Tom Porter attended the William and Flora Hewlett Foundation’s annual Open Educational Resources (OER) meeting in New Orleans, Louisiana. The meeting site was unique, taking place aboard a steam-powered paddlewheel ship, the American Queen. The four-day meeting brought together current Hewlett Foundation grantees as well as other organizations engaged in OER, open knowledge, and education. 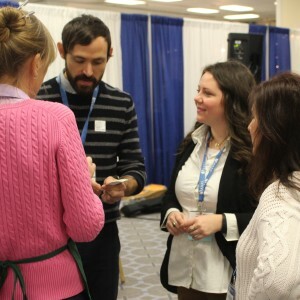 The event was the ideal platform to connect with members of academia and other nonprofit organizations. 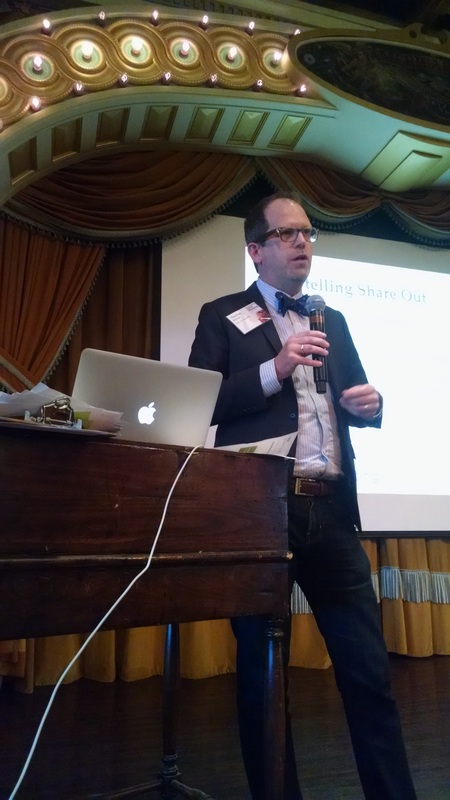 Tom was invited to share the story of the Wiki Education Foundation during a morning work session that included all 200+ attendees. This was the first time the Wiki Education Foundation has participated in the Hewlett Foundation’s annual OER meeting. Tom continued to work closely with other members of the Foundation’s senior leadership team to develop fiscal year 2016–17 development plans and funding scenarios. At our all-staff meeting in February, our primary goal was to analyze the results of Wiki Ed’s first two quarters, set milestones for the remaining two quarters, and make adjustments as needed. Based on our improved annual planning process, we could spend more time having open conversations about plans for the next fiscal year. Members of the senior leadership team presented their first thoughts on programmatic priorities for 2016–17, followed by a group discussion for all other staff to ask questions, provide feedback, and offer suggestions. As part of our all-staff activities, we traditionally train staff members in specific areas of expertise. 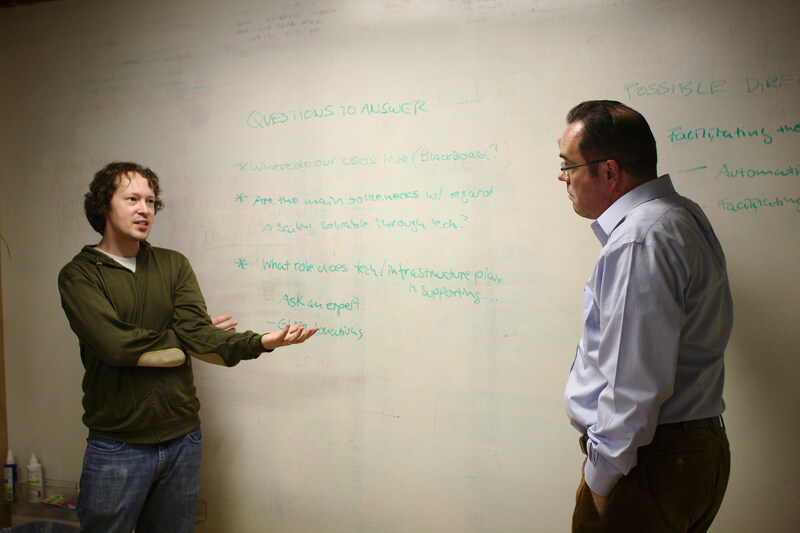 In the past, we’ve trained staff in crisis management, communications, and program evaluation. This time, we chose Wikipedia and general wiki skills. We sought to improve new staff members’ ability to use our office wiki more frequently, and to better understand some of the basic processes on Wikipedia. Frank set up an annual plan and budget document for members of the senior leadership team to start filling in their sections. Frank started drafting the high-level sections of that document to set the general direction of the next fiscal year. We’re expecting to deliver the first draft of the annual plan and budget to the board earlier than we have in previous years to allow for more time for feedback.